Another Deepavali post about two groups of people who always leave me with mixed emotions. The first group of people are those for whom Deepavali or for that matter any other festival is just another day at work because their job does not permit them a holiday. Look around you the driver who takes you to your home town, the milk man who delivers milk rain or shine every day, the policeman who directs traffic and also keeps the city safe, the corporation sanitation teams who work to clean up the mess we leave behind, the list goes on. I happened to use the Deepavali holiday to complete the shopping for the month and we were fortunate to find one departmental store open where we completed our purchases. I noticed that the staff were dressed very nicely on that day and wished every shopper who came into the store. I asked the girl at the billing section if they had an early closing for the festival and why they were working on the day, she replied very sadly that they have one weekly off and this day was not counted as a holiday. My Deepavali wishes to her sounded hollow as she replied with a sad smile. The second group of people are those who migrated from the North of the country and have made Chennai home and consequently they end up celebrating the festival a day later. These people tend to work on Deepavali day as they believe that the Goddess of wealth will visit them on the day and so they keep their workplaces open. Since many of them are into retail / wholesale they tend to keep their shops open and work hard when the rest of the city celebrates. After the work is over, they come home and then start the celebrations. They then start to set off the loudest crackers late in the night when the rest of the city calls it a day. They do not care that the cut off is 10 pm for the loud crackers, they do not care that by celebrating late in the night with loud explosions they not only disturb the peace but are a public nuisance especially to the aged and the invalids. I do not think they will spare a thought for pets considering that they do not care for their fellow beings. A few years back out of sheer frustration from the noise and my inability to sleep ahead of the next working day I had to threaten one family with a bucket of water in hand that I will rain on their parade. After a heated argument they kept the “bombs” aside and set off the sparklers and other displays. 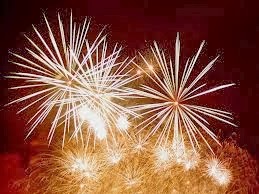 This year even as I type I shudder when I hear some loud bangs go off nearby nearly an hour after the cut off.